Below are common attributes associated to Mexican Heather. Become a care taker for Mexican Heather! Below are member comments regarding how to plant Mexican Heather. No comments have been posted regarding how to plant Mexican Heather. Be the first! Do you know how to plant Mexican Heather? Below are member comments regarding how to prune Mexican Heather. 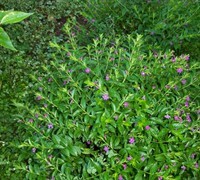 No comments have been posted regarding how to prune Mexican Heather. Be the first! Do you know how to prune Mexican Heather? Below are member comments regarding how to fertilize Mexican Heather. No comments have been posted regarding how to fertilize Mexican Heather. Be the first! Do you know how to fertlize and water Mexican Heather? Below are member comments regarding how to deal with Mexican Heather's pests and problems. No comments have been posted regarding how to deal with Mexican Heather's pests and problems. Be the first! Do you know how to deal with pests and problems with Mexican Heather? In frost-free zones, this heather makes a great evergreen groundcover with non-stop bloom in borders, foundation plantings and containers. In USDA Zones 8 and above, treat it like a perennial for spring-to-fall interest in beds and borders. In cooler climates, enjoy Mexican heather as an annual, either in the ground or in pots. In any area, the fine-textured foliage and flowers make it a perfect partner for bolder leaves and blooms. It also makes a nice houseplant. The Mexican Heather rarely need pruning. Prune lightly if the plant becomes scraggly looking. You can trim it to the ground if it becomes leggy and it will grow back easily every time with lush growth and more blooms.